Hi, dear WOYWW friends it is AGES I last posted here! But Julia, I cannot let go, so here I am back to be part of your wonderful party. A lot of incidents kept me from posting, some good, some not so good. Just in case you don´t know, I am Gabriele. And I am the only painter among a bunch of lovely, talented stampers. That is very interesting and challenging. And it gives me a lot of inspirations. So in the future, you will see me doing a lot of stamping – my way. I am not very accurate in my stamping, but for me that is ok, because I use stamps in a different way. You will see in the AJ pages Half Empty/Half Full, that I love to use stamps to make my background richer and more interesting. But now back to my desk. There you can see some vintage photo albums and tons of old photos. I have now 14 albums – 14 great possibilities to journal in all kinds of ways. This is such a treasure! Although I don´t know most of the people on those photos, they tell me many interesting stories and are fantastic for collages. Priceless!!! While doing the backgrounds for these pages, I was pondering about my problem: it is hard for me to find the right words for my AJ pages. I like my pages to tell a story that moves me in the first place, but then I cannot write anything on them. Quotes from other people might be nice and carry an important message, but they are not my words. And here I found the knot: I wanted to say something important. Important for whom?? And what???? What is important in my life?? When I open my eyes in the morning, that can be important and not be taken for granted. Some years ago I thought I might die of my cancer, but I did not and I am grateful still being alive!! So I decided to write a little column in the future about all those small, amusing, sad, trivial, but so important things for my life and of course create whatever comes to my mind to illustrate it. Back to Half Empty/Half Full. After creating the background with acrylics and some collage (using two of my photos) and some of Rubber Dance stamps I stepped back and thought, the pages looked quite ok, as they were. Here I used one of the photographs of a lady that sits on the beach, apparently alone. But she seems to be looking at someone. Yes there must be the photographer – someone she knows, likes? You can also see the stamping – that wonderful quote and the red round thingies on the right, here as enlargements. On this page I used some different flower stamps, I will list at the end of this post. Here I stamped red flowers and very delicate spider web like flowers in several shades of turquoise. It is easier to see in the enlargements. But I forced myself to write some sentences about the motto. I also accepted my handwriting, which is not very nice, but it is mine. That makes it unique and that is fine. The colours of both pages look different, as the last two are taken with a camera, the others before were scanned. Dear friends, that is all for now I have written quite a lot this time, I hope it wasn´t too boring for you! Thank you very much for your visit and I hope to see you soon! 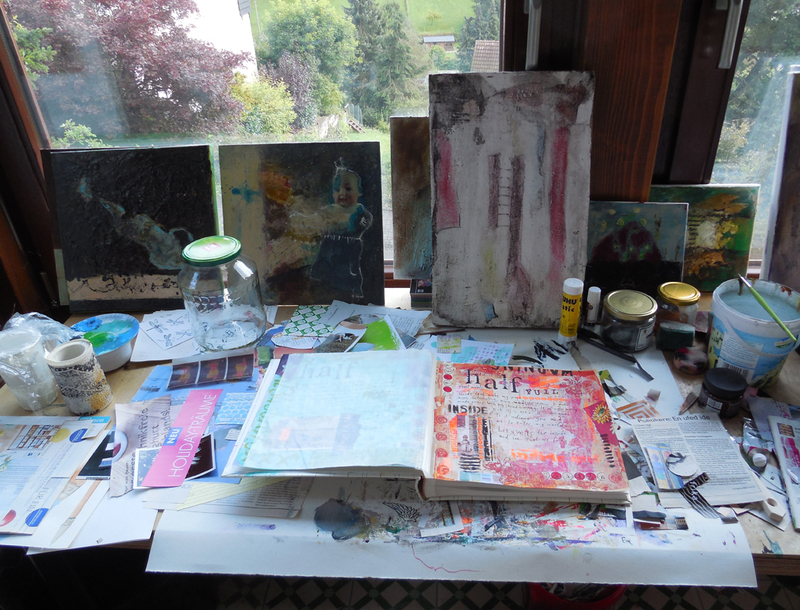 Dieser Eintrag wurde veröffentlicht in art journaling, Rubber Dance, WOYWW und getaggt mit background, blogging, collage, grungy, mixed media, painting, Rubber Dance, stamping, WOYWW am 13. August 2014 von art-a-tag. 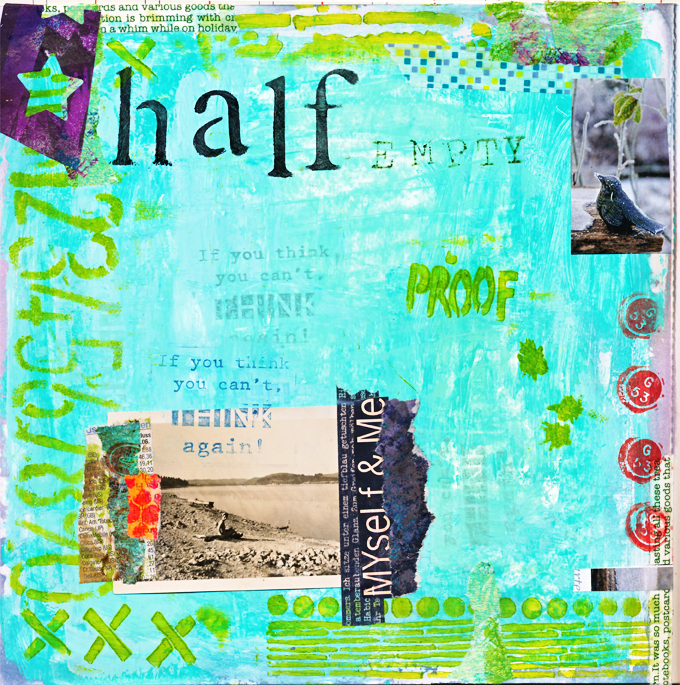 Love your use of colour, the cool tones for the ‚half empty‘ and the bright and warm welcome ones for ‚Half Full‘. Nice to see you again! Thank you Julia, my very pleasure!! Fabulous pages and lovely stamps! Thank you Susi and happy WOYWW! Gabrielle, I’ve already told you how great the art is on facebook so I’ll comment on your post. It is wonderful. I really enjoyed your thought process about your journal page. I agree that each morning I wake up is a wonderful day. Thanks for sharing with us. Gorgeous pages!! I have some really old photos too, and have no idea who the people in them are…I love your idea of using them for a collage! Also, I’m not crazy about my handwriting either, and used to type out and print all my journaling. Then I read that your own handwriting is so much more personal and one day after you’re gone and your family has inherited your scrapbooks/journals, that handwriting is going to mean so much more to them than something you printed off your computer. So I made the switch and write out everything now! Great post, Gabriele! 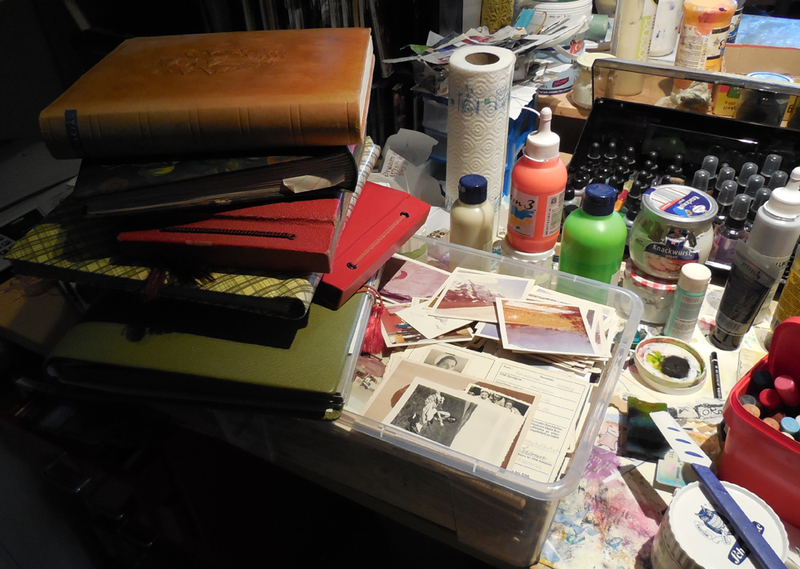 Fun to see a bit of your workspace, and those vintage albums look very yummy! :-))) Love your pages, and glad you asked the right question – whom is the writing for? Every day is a gift, and life is full of important „small stuff“. I know what you mean about writing on your journal pages. I’m wondering the same sort of thing. I have several backgrounds that I created in the class but am wondering what I’ll do next with them. Handwriting is as individual as we are and from what I see yours has a nice style to it – embrace it. Congratulations on being part of the Design Team. lovely pages your art id definitely more full than empty, love the mixed up collage feel to your work. the view out of the window is very inspiring too. I love your half full page…I think it’s so important to be positive in life. The colours you use are gorgeous! 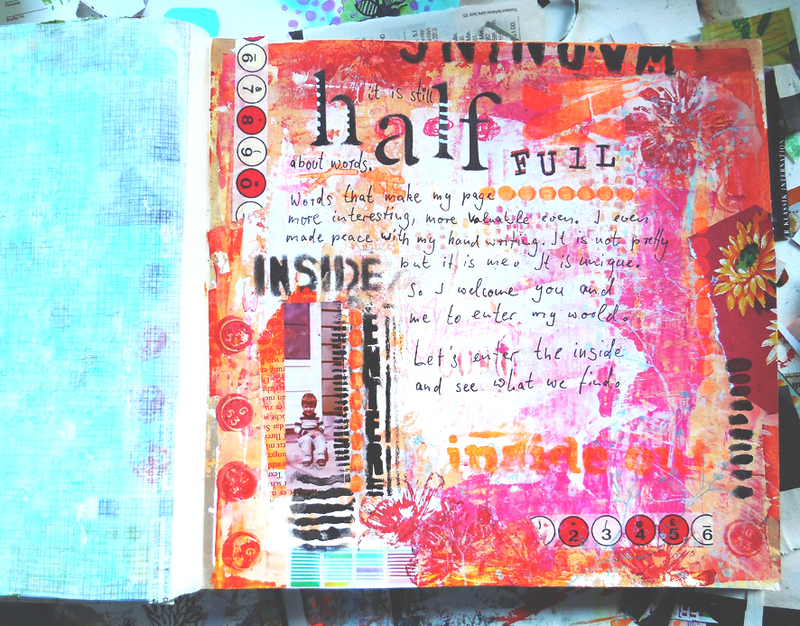 Your colourful journal pages are lovely! Have a good week, and thanks for visiting too. I love all the colour, all the layers, and all the text – nothing I love more than a long meaty blog post. INice to read the background and I’ll look forward to your different stamping. Must check out the stamp line too. 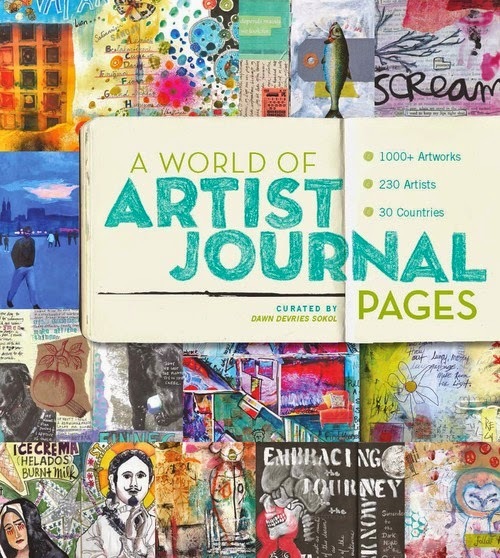 i love your art journal pages! you are inspiring me to consider starting one of my own- thank you. 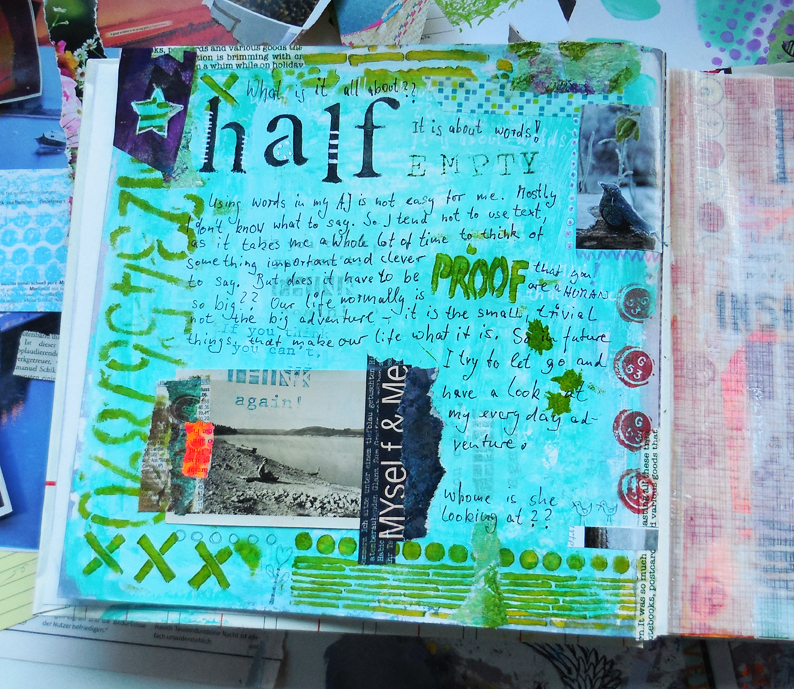 lovely journal pages and lovely creativity! Thank you for sharing. Congratulations on becoming a member of the Rubber Dance design team. The painting at the back of your desk with the vertical strips caught my eye. Is that finished or a background for some journaling? I’m sure you journaling will flow the more you do. Have fun with it! I’m guest designing for Bibi! I love her nature stamps! I’m a painter too, so you never know where my stamps will end up. I feel right at home at your desk. Oh My! such beautiful work you do….what a move into stamping with the beautiful art you do… Love your work and so glad I found your blog. Thanks for stopping by my place and leaving such kind words. Beautiful and inspiring work, dear Gabriele. Love your blog post with all the colour and the cool and warm pages. This should be interesting for those like me who do not find colour so easy to do. Great color and texture …. lovely post. I so much enjoyed reading this blogpost. I really like both pages, each so different. 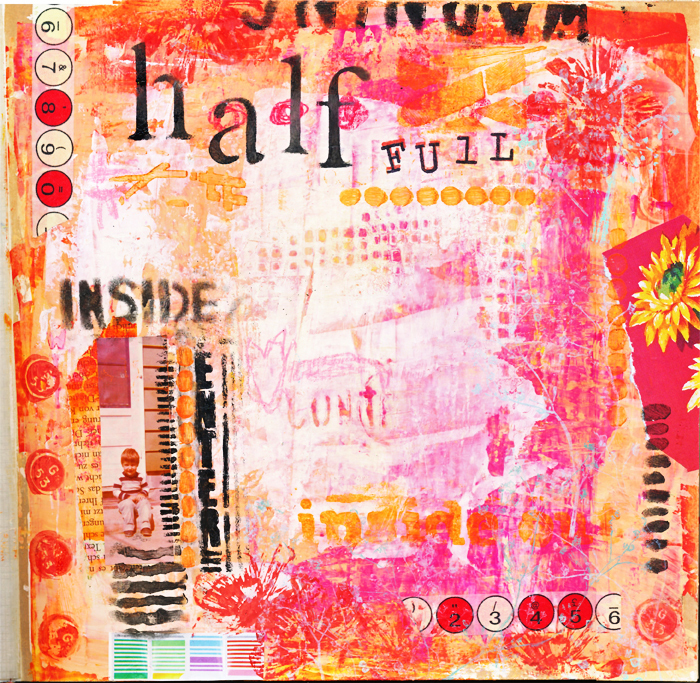 It will be fascinating to see how you incorporate rubber stamps into your wonderful paintings.